UTSA's Institute of Texan Cultures.Photo by Rachel Holland. It’s an invitation no one should decline: What would you do with the brutalist period buildings on the southern border of Hemisfair Park, completed 45 years ago for the 1968 world’s fair? Reshape them or knock them down? It’s arguably the single biggest unworked piece of the Hemisfair Park puzzle as San Antonio embarks on a decade-long redevelopment of this 104-acre downtown jewel in the rough. It’s also, in my opinion, the least (publicly) discussed aspect of the task before the Hemisfair Park Area Redevelopment Corporation, CEO Andres Andujar, and the 11-person board appointed by City Council. The argument can be made that far too few people in San Antonio are paying much attention to the park’s redevelopment, despite its centrality and historic importance in a city otherwise so focused on its own urban core transformation. Hemisfair Master Plan conceptualization. Click image to download the master plan. One reason is that such conversations tend to be controversial whenever something out of the ordinary is proposed. Which is exactly what is called for along that part of Hemisfair fronting on Cesar Chavez Boulevard. The three buildings, of course, are the former Texas Pavilion, the United States of America Pavilion, which actually included the United States Confluence Theater and Confluence Exhibition Hall, and the ’70s-era San Antonio Federal Building. Am I confusing readers 40 and under? Today, the buildings in question are, respectively, UTSA’s Institute for Texan Cultures, the Judge John H. Wood Jr. Federal Courthouse, and, as mentioned, the post-world’s fair constructed San Antonio Federal Building. The Adrian Spears Training Center, adjacent to the Courthouse and once the U.S. Exhibition Hall, is not part of the charrette for reasons not immediately clear. Adrian A. Spears Judicial Training Center. Photo by Rachel Holland. Charrettes, of course, are not formal proposals. Architects and others aren’t burdened by budgets, historic preservation, or politics. Charrettes are a forum for ideas and conversation, for thinking outside the box, if you will excuse a bad pun consistent with the period architecture in question. There are two key dates. The first is Saturday, April 13, the deadline for submissions, and an open house at the AIA offices at the Pearl’s Full Goods Building where Andujar will give a presentation at 11 a.m. and lead a discussion. The second is Tuesday, April 16 at the Alaskan House in La Villita where District One City Councilman Diego Bernal will host an open house and a display of the submissions mounted for public review. Charrette concepts are not binding, of course, and previous charrettes in San Antonio that have looked at many other urban core transformation challenges often failed to spark innovative change, but at a minimum they start a conversation that might not otherwise happen. That, in my view, is the case with the brutalist buildings and their vast parking lots that stand sentinel on Hemisfair Park’s southern border as if to warn all in Southtown: Stop here. No further passage. The first phase of the park’s redevelopment plan, set to be completed by mid-2015, will convert much of the 36 acres controlled by the HPARDC into public park spaces, increasing the open space from its current 15 acres to more than 24 acres. The inclination to open the park as much as possible, it seems to me, should guide the city’s treatment of the world’s fair’s remnant buildings. None, by the way, are inviting to the public. The ITC suffers, in particular, as a cultural venue. When was the last you went there to view its offerings? The ITC is often all but deserted of visitors, its vehicle entry is poorly designed, and its low-slung portals are unwelcoming to pedestrians. Most days, its exhibition halls are dark and empty. UTSA’s Institute of Texan Cultures.Photo by Rachel Holland. UTSA officials have been lukewarm to informal proposals to relocate the ITC to a newly-built, glass-fronted space that could be created after the older, western part of the Convention Center is demolished. I’m not sure why they want to stay where they are, but if they do stay, the ITC will never be more than a third-rate venue, no matter the aspirations of local leaders or the UT System. Judge John H. Wood Jr. Federal Courthouse. Photo by Rachel Holland. At least the feds can compel people to show up to the courthouse. Once the necessary funds are allotted to construct the new federal courthouse and offices on the site of the former San Antonio Police Department headquarters, we will be left with an inefficient snare drum of a building with no practical purpose. It’s hard to imagine even the most ardent preservationist arguing for its protection. The memory of Judge Wood, the only U.S. federal judge ever assassinated, deserves to be honored in some new form, but not the building where he once worked. San Antonio Federal Building. Photo by Rachel Holland. The adjacent federal building, now an office structure, can presumably be gutted and reskinned as a condo tower with offices and ground retail space. But to do so robs local firms from designing a truly original and sustainable building consistent with the overall vision for the park and the downtown. San Antonio is woefully short of statement edifices. Our best buildings, with some exceptions, are still our oldest buildings. Leaving the existing buildings, never intended to be permanent, in place along Cesar Chavez Boulevard will make it impossible to connect the park to its southern neighbors. It forfeits the opportunity to link the downtown with Southtown in the same way the remaking of lower Broadway and the transformation of the Municipal Auditorium into the Tobin Center for the Performing Arts will link downtown to Midtown. I suspect there will be no shortage of people disagreeing with my views. That’s the beauty of democracy, of course, and the attraction of the charrette. Let the conversation begin. The Rivard Report, of course, looks forward to publishing other points of view. Regardless of what happens, I hope we can learn from the other grand cities and when given a choice to do something, we choose to make a statement of excellence. I have seen other cities’ downtown modern buildings and was horrified at the way they handled things so it is my hope that we do better. A city skyline does define the city in many ways, and the choices we make are long lasting. i will TIE myself to this building.. THIS building AND the ITC were built to LAST… yes they were, just like the TOWER of the Americas was built to last. The convocation building could be turned back into a theatre for the neighborhood AND it could be also turned into high end housing. with two apartments for each floor. I talked with the architect who is working on this,, and he told me he has already created “ideas” for the US court house AND the government building to the east for housing. sure the highrise government building is NOT original to the site, but why create waste when you could go FULL GREEN and reuse this building,, install a few balcony’s and wahla! What’s the difference between being a victim of ‘brutalism’ and the victim of the whims of whatever politician/architect that think their ideas will stand the test of time? San Antonio prides itself in being a ‘historic’ city and wishes it had more missions and monuments of historic value, but then provokes discussion of which bits of the city to destroy for no valid reason other than being ‘outdated’. If the city in itself is a ‘museum’ then why erase the past? Why not shift the discussion to tackling the rancid suburbification of the city outskirts – designed by home builders, not ‘architects’. Certainly the answer to Hemisfair is redesign, not demolition. Normally I would say dozer but this town does a real good job at reusing old buildings…why not this one too? i think they are beautiful buildings, put to worthy reuse that has sustained a vital traffic of employees and public in our city center for decades. Surely we can work our way around the best of them as we rebuild the neighborhood. Oh, and don’t mess with Beethoven Hall or any of the grand old houses. Carve your streets, populate them with mixed use, let the best buildings stand. The ITC and courthouse buildings are very distinctive. They should be reused. My first inclination was to bulldoze. But it’s not very green, and it seems we could get creative and try to make them cool. Maybe bulldoze the office building though if it will be an eyesore. I agree it cuts Southtown off and considering Southtown residents are more apt to use the park on a regular basis it would be necessary to make this more open and available to them. Just make it cool so we have more of a community feel for all the city to take advantage of. By the way, does anyone know what they plan to do with the small historic house-type buildings lining the entrance from S. Alamo? I would have to agree with Kari ( Gary, Grant and Wayne, too). There has to be a more creative way to update this space than bulldozing – we’ve got some crazy amazing architects, engineers, designers in town. It would be cool if Hemisfair redevelopment/future projects went for a Leadership in Energy and Environmental Design (LEED) Platinum designation. Would be hard to do if you wasted entire buildings. Oh dear. Another design yack fest about what to do with HemisFair. Yawn. How long is this indecision going to go on? Another decade or so? Stop talking and do something. Hire Ai Weiwei or Zhang Xi or both for that matter. Have them draw up the world class plan for the area in question and be done with all of this HemisFair yackity yack. At Texas A&M we had a saying that a camel was a thoroughbred race horse designed by committee. That is what HemisFair Park is going to look like by the time all of these “design charrettes” get finished with it. Hire someone who knows what they are doing and go for it for crying out loud. This is getting tiresome. I could see a park filled with all things GREEN, show us all how to plant gardens, what grows well, show us how to recycle rain water, how to do our own solar panels for heating and electircity, make Hemisfair park a GREEN Learning Center for all of San Antonio. Restore the Confluence building as a Theatre, either LIVE or Screen. could make a wonderful IMAX Theatre. and also reuse the adjoining Exhibition Hall AS just that. either a Museum of Hemisfair and the Fair its self or as an Exhibition Hall for GREEN Design. I think the Highrise can be use as a GREAT condo building. Build 3 or 4 story parking on the south side of the street, have bridges crossing OVER the busy street so that people do NOT get hit. it is the STREET that divides the park from the residential neighborhood to the south. NOT the architecture. Ooh, an Omnimax theater could be fun. Sherry is right. Get someone who knows what they’re doing instead of some “by committee” junior high operation. Also, bull doze those buildings please. People asking that they remain must be time travelers from 1960 Russia. I think Bob has articulated exactly how I feel. I will also +1 with Jon on the 1960 Russia comment. San Antonio does a very good job of preserving its history and making sure we don’t needlessly knock down buildings. However, in this case I fully support all of them being bulldozed. Oh yes! Hiring a prolific Chinese visual artist is exactly who San Antonio needs. I agree with your sentiment – Too many cooks in the kitchen ruins the soup – But let’s be a little more rational. Especially, when we have great talent here in the city already. Regarding the LEED building status; I wonder how attainable that would be for buildings constructed with no regard for energy efficiency in the first place? I’m no architect but, pretty sure concrete isn’t the best building material for south Texas as it collects a lot of heat during the day. The courthouse is a pretty distinct building and could be functional if turned into some type of community venue or small theater. I’m talking about the types of international cultural centers you see in bigger cities like Sydney, London, and Madrid. Hemisfair was a celebration of international culture and the future, so why not re-inject some international flavor with a focused small venue. The other three are Brutalism at its worst and need to go, but the courthouse building is worth saving. Thank you for the thorough writeup, Bob. 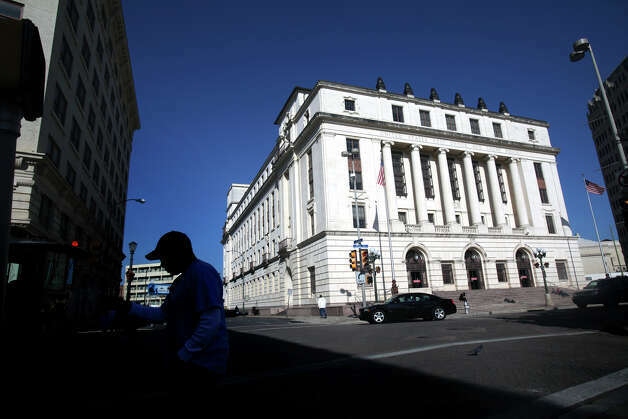 I also originally favored demolition of the ITC, but I’ve always been a fan of the courthouse. I’ve come around on the ITC to some degree b/c it’s size is part of its appeal – perhaps it could be hollowed out to create a ring of spaces around a grand central courtyard/park with multiple street-level entry points, for instance. The idea for the charrette is not another yak-fest, as one commenter pre-judged it, but an invitation for local architects to dramatically reimagine these buildings in a setting w/o many rules (or too much deference built in). We have a preservation problem in SA – we like to save buildings, but we often do it in a way that makes them third-rate spaces that can’t compete with more modern venues. They end up rented to public agencies or nonprofits at below-market rates, or they sit empty. If we’re going to save them – the Conservation Society is determined and Andres is willing to defer to the public – let’s imagine how incredible they could be. The idea was inspired in part by the fight to save the Goldberg building in Chicago, and by the local AIA’s Emerging Professionals Committee, which has worked to engage challenging urban projects like the effort to revitalize the near East Side. Maybe what these buildings need is a fresh, irreverent eye. Agreed. The line between yak-fests and community/professional input can be blurry – but this particular charrette (and the master planning of Hemisfair park in general) seems to be on the side of the latter. Hemisfair has so much potential, I don’t mind waiting for architects, engineers, public hearings, and committees if it means that potential will be realized. The courthouse building has possibilities, reminds me of the Sculpture Museum in D.C. Could be a really cool theater. The ITC is UGLY and when you are inside the building, it feels like you are underground. I can’t see any fix for it. Isn’t partial demolition necessary anyway for a new building? I’ve always hated those buildings. The Brutalist style offers nothing to engage me. I hear that the shape of the buildings creates odd spaces in the floorplan that are difficult to use and maintain. Let’s build something else. Bulldozer. Call them ‘brutalist,’ call them ‘boxes’ (but lets don’t get into any name-calling games). Personally, I like those ‘containers’ on the south side of HemisFair Plaza; they are MY boxes. And don’t tell me of the ‘wonderful’ transformation of the Municipal Auditorium into the Tobin Center for the Performing Arts. I think the ‘renovation’ is an abomination. That whole ‘improvement project’ is as fake as the facade of the Texas Theater. 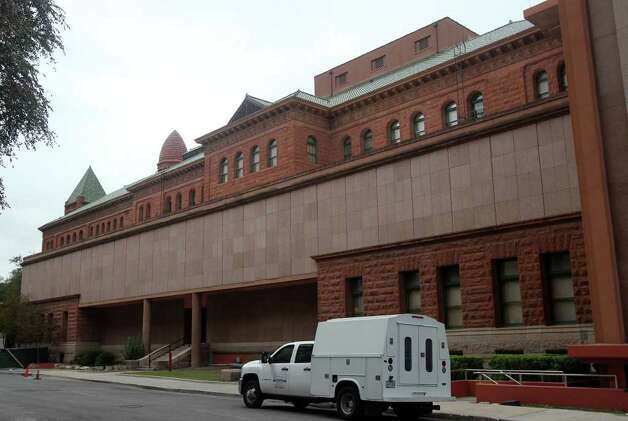 If you want to get rid of boxes, get rid of the appendage to the Bexar County Courthouse. Compare the side of Big Red http://ww4.hdnux.com/photos/06/55/17/1758151/5/628×471.jpg to the front http://www.texasescapes.com/SanAntonioTx/Images/BexarCountyCourthouseSanAntonioTexasPCTem.jpg . 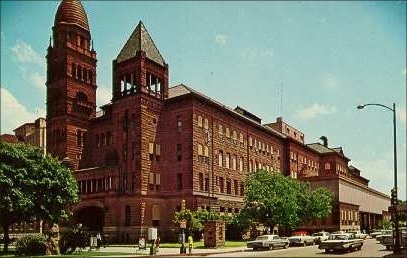 Does anyone remember what the downtown Post Office looked like before the Richardson Romanesque features were removed? It was designed by James Riely Gordon, the same guy that built Big Red. Take a look at the Alamo Plaza Post Office before http://blog.wilkinsonranch.com/wp-content/uploads/2011/09/092311_1552_MyResearcha2.png and the way it looks now http://ww3.hdnux.com/photos/14/04/66/3165586/5/628×471.jpg . Which do you like better? At one time, Beaux-Arts architecture fell out of favor. Art Deco was once hot, then not. If left alone, period styles invariably come around again. Fortunately for Texas, many of the magnificent structures of the 1936 Centennial Exposition were preserved. To this day, Dallas uses these Dieselpunk grounds for the annual Texas State Fair. The rest of the year, the complex houses a collection of museums as well as the Cotton Bowl. We could do the same for our fairgrounds. Instead of turning HemisFair Plaza into a convention center (mainly for tourists), we should use it for education and entertainment for the locals (and for tourists too, if they want)! I remember HemisFair and miss the monorail, the sky ride, the ponds and lagoons, and the Arena (btw, are we still paying for the Arena?). It is enough that the wonderful sculptures of HemisFair have disappeared. The remaining buildings should stay. I took a class at the Southwest Inter-Governmental Training Center in the 1970s and remember it fondly for its many architectural eccentricities. It is the now the Adrian A. Spears Judicial Training Center but it’s still an interesting building with unusual features and pleasant surprises. The Judge John H. Wood Jr. Federal Courthouse should be preserved for similar reasons. As the U.S. exhibit in 1968, its historical significance alone should be reason enough to save it. So it looks like a drum — so much the better! The exterior framework and glass walls still speak of the promise of the future. If we ever need a replica of the Little Dipper School from the Jetsons TV show, we have it! Speaking of futuristic buildings, I toured the Marin County Civic Center on my last trip to California. Frank Lloyd Wright designed this building to house city, county, state, and federal offices. Inside, you will find everything from the local library and county jail to the Post Office and federal legislators. While the San Antonio Federal Building is not as glamorous, it serves as a home for the Social Security Administration, our representative, and other federal offices. And then there is the Institute of Texan Cultures. I’ve always gotten a kick out of this ‘inverted pyramid.’ Here again is a building whose architectural mysteries invite wonderment and investigation. The projected images on the domed ceiling should never be doomed. If the ITC is devoid of visitors, it is probably because of steep admission fees. I used to visit often when it was free. While the Trinity of the Federal Complex have their own merits, the Institute has many. The outdoor museum (the Back Forty) contains samples of houses of yesteryear and is the site of the Folklife Festival. And exhibits in the interior instill pride of the diversity of our culture. The location of the ITC could serve as a stepping stone over the fence (that is, IH-37) to unite the Alamo Dome and St. Paul Square. “Reshape them or knock them down?” No, thank you! Instead of considering ‘them’ in such a negative light, perhaps we need to knock down our preconceptions of the importance of tourists and reshape our ideas of beauty, functionality, and history for the people that live here. When Will Rogers dubbed San Antonio as “one of four unique cities in America,” he was thinking of the neighborhood between Market and Durango, between Alamo and Bowie. Those buildings on the south side of HemisFair Park are more valuable than Convention Center space. They represent justice, democracy, history, and fun! They should remain. Great post Don! Glad to see I’m not the only one who likes the ITC building. Rather than brutal, to me the ITC building evokes strength and importance. The only improvements I think could be added are recycled water streaming over the rooftops edge into the pools below, and a natural pathway upon the raised earth encirling the building. I believe the Federal building could be re-used and if necessary bull dozed. However, any building that was built for the 1968 Hemisfair should be preserved because they are unique and links to San Antonio’s historic past. Anyone who was raised in the 1970’s at one time took more than one field trip to Hemisfair park and wonderful memories were created and these structures take us back to those times. Anyone born after the 70’s did not experience the magic and events held at the park during the post-Hemisfair era. The grass hills everyone slid on are gone. The monorail, playgrounds, arcades, skyride, the Buckhorn building, the Hemisfair arena, water ways and walkways followed. There are not a lot of traces of Hemisfair 1968 left and think tearing them down is a big mistake. They should be landmarks. The former Hemisfair ’68 Woman’s & Kodak pavilions are also worthy of preservation, and are constructed on a much smaller scale than the adjacent US Pavilion and Institute of Texan Cultures. The former RCA pavilion also still exists as the Hemisfair Park police station, as does the Mexico pavilion (the only existing international pavilion constructed for Hemisfair ’68). Many original features left from Hemisfair ’68 have been allowed to deteriorate, which is unfortunate.